Shares of Goldman Sachs (NYSE:GS) were heading lower last month as the investment bank continued to face consequences from its involvement in the Malaysian 1MDB scandal. During the month, the bank faced a number of lawsuits related to 1MDB, and Malaysia said it would seek a full refund of all of the fees paid to Goldman. As a result, the stock lost 15%, according to data from S&P Global Market Intelligence. 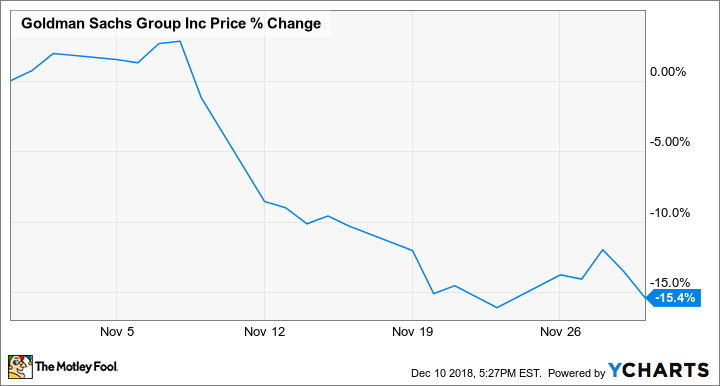 As you can see from the chart below, the stock started plunged on Nov. 12 as the 1MDB news started coming out, and it continued sliding from there. Goldman shares fell 7.5% on Nov. 12, its worst one-day decline in seven years, after Malaysia's finance minister demanded a full refund on about $600 million in fees the country paid for the investment bank to help its state investment fund, 1 Malaysia Development Bhd., raise billions of dollars in 2012 and 2013. Goldman Sachs shares have been reeling from the scandal for much of the year as earlier in November, the Justice Department accused two Goldman executives of bribing and laundering money through the fund, a violation of the Foreign Corrupt Practices Act. Later in the month, Morgan Stanley downgraded Goldman to "equal-weight" on concerns stemming from the regulatory risk in the Justice Dept. 's investigation, and a sovereign wealth fund in Abu Dhabi also sued Goldman, accusing it of playing a primary role in the banking scandal and initiating bribes to fund executives. The $600 million Malaysia is demanding alone wouldn't cripple Goldman as the investment bank generated more than $4 billion in net income last year. However, the reputational risk to Goldman could deliver a more lasting blow to the stock if other potential clients avoid it while it has the stench of criminality around it. Additionally, the Department of Justice investigation could lead to a sizable fine against the bank and another round of negative headlines. Goldman shares are arguably cheap after the sell-off as they are trading below book value and at a P/E of just 7.2. However, given the flattening yield curve, which is generally a negative sign for banks, and the ongoing investigation, the stock is likely to stay down in the near term until those market conditions change or the investigation clears the company.